Located at 1.650 mts. above sea level, Nevados de Chillán Ski Center has 28 tracks in 35 km. 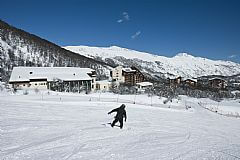 of snow, with a skiable area of 10.000 hectares. It has nine lifts (one triple chair, three double chairs, five platter lifts) and the longest track in South America, called Las Tres Marías, with a length of 13 km. 30% the center's 10.000 hectares is destined for beginners, 40% for intermediate skiers, and 30% for experts only, with an incline of 1.100 mts. The center also has a snowpark. 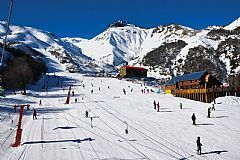 Furthermore, it one of the ski centers that offers the greatest variety of activities, such as nordic ski, randonnée, heliski, snowmobiles and sledges, among others. Its thermal center has nine sulfur and iron pools, which are open all year, and in summer you will find great quaility recreational activities. Location: Bío-Bío region, 194 km east of Concepción. Chillán is 82 km west. When to go: All year. Ski season is between June 15th October 15th. Attractions: Termas de Chillán, Chillán Volcano, Nevados de Chillán Hill. How to get there: Santiago-Chillán (407 km. ): by air, public and private transportation. By land, take the 5 Sur Route up to Chillán. To get to the center, take the left in the road that borders the river. It's a 82 km. drive, 27 of which are unpaved. 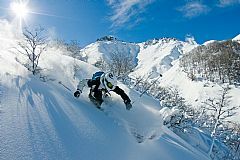 Activities: Skiing, nordic skiing, randonnée, snowboarding, heliski, snowmobiles, sledges, horseback riding, trekking, mountaineering, mountain biking. Services: Accommodation, food, transportation, entertainment. Surroundings: Shangri-la, Los Pincheira Cave, Las Trancas. 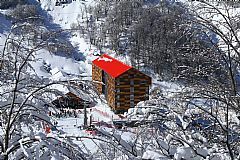 Termas de Chillán has a ski school run by international instructors, who give lessons for all levels and snow sports, such as nordic skiing, randonnée, snowboarding, and such. There are two types of lesson: individual and group lessons. Individual lessons can last between 1 hour and 1 day. Group lessons last 2 hours. Children between 3 and 8 years can learn how to ski in the Mini Ski School, where qualified instructors will teach them in a nice and fun way. There is a "baby lift" especially designed for them. The lessons can last one hour, half a day, or a whole day, including a special lunch. 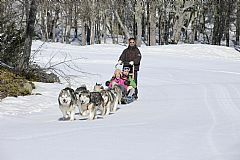 Termas de Chillán has a skiable area of 10 thousand hectares -the largest in the country- with 28 runs (35 kms. total), and an incline of 1.100mts. The difficulty level of each track is categorized with colours: 30% of the runs are graded easy (green: very easy / blue: easy), 40% intermediate (red) and the remaining 30% is difficult (black). The yellow tracks are freeride. Las Tres Marías is the most emblematic track of this center, because it is the longest in South America (13 km) and runs through beautiful native forests. 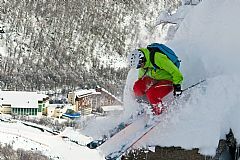 For snowboarders, Termas de Chillán also has a 250 mt. Snowpark with a half Pipe, quarter pipe, fun box and a Jump ramp. 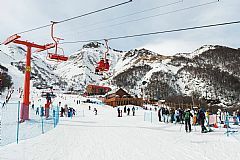 In the center there are 11 lifts, 4 of which are double chairs (Silla Peta is now in operation), 1 triple chair, and 6 are platter lifts (Poma). Don Otto is the longest lift in the country with 2.500 Mts. 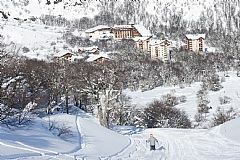 In Termas de Chillán there are three Ski Rental stores, located at the Alto Nevados Hotel, Nevados Hotel and Grand Hotel Termas de Chillán. In them, you can rent accessories and complete equipment for both skiing and snowboarding.